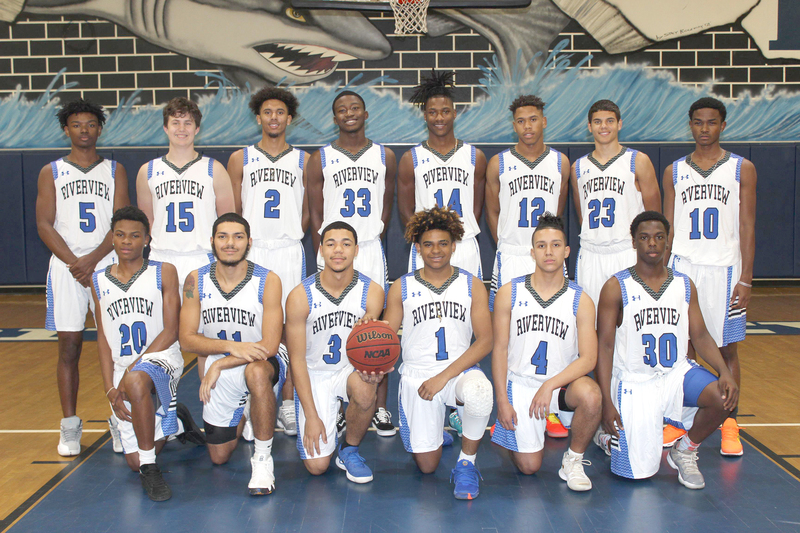 Coach Milton Clifton’s Riverview Sharks won the Hernando Tournament over the holiday break and sport an overall record of 9-7 but continue to struggle to get out of the cellar with a 0-5 mark in 9A District 6 basketball. The Sharks went to Jefferson for a Jan. 15 game then will travel to Newsome on Jan. 18, visit Plant City on Jan. 22, and go to Blake on Jan. 23. Riverview finally returns for home basketball games against Spoto Jan. 25 and Bloomingdale on Jan. 31. The Riverview girls under Coach Gerard Batista are in a similar jam —­ trying to play their way out of last place in 9A District 6. Meanwhile, the Riverview wrestling team continues to dominate on the mats as the new year begins. In the first basketball tournament of the holidays in Bradenton, Coach Clifton’s Sharks finished in third place with a 2-1 record. Riverview beat Bayshore in the opening game 55-53 and then lost the next night to Evangelical Christian of Fort Myers 60-59. The third game against Chamberlain also went Riverview’s way 52-40. After New Year’s Day, the Sharks participated in the Hernando Holiday Tourney in Brooksville and finished in first place by winning all three games, capping off the championship game by beating Lennard 76-72 on Jan. 4. The two games preceding were also won by Riverview. First, they beat Gulf High of New Port Richey 52-30 and on Jan. 3 topped the host Hernando High of Brooksville 74-64. Riverview High School Varsity Assistant Brian Bowman commented that the Sharks took the trophy with good teamwork, great defense, and “we just played smart.” The Sharks Jaden Ramos led the team and was awarded the All Tourney player award for leading in scoring, defense and “all-round talent,” according to Bowman. Returning to the regular season and district play, the Sharks lost to Alonso on Jan. 8 in Tampa, 65-59. Bowman said, “Alonso was a challenge. We went toe to toe with one of the best teams in the state. Alonso is the district champ. We played well, but they played better.” Bowman said the Sharks look forward to facing Alonso again. “This time we’re gonna’ win by 5,” he said. After leading Riverview Sarasota 26-25 at halftime Jan. 11, Clifton’s Sharks lost 64-60. As for Batista’s girls, RHS they lost 49-25 to Riverview Sarasota. It does not get any easier, as the lady Sharks faced Newsome Jan. 14 followed by a trip to Tampa, to play Jefferson Jan. 15. The Lady Sharks’ record going into those games was 5-8 overall and 0-3 in District. Previously, to open the new year, the girl Sharks fell at Alonso 52-39 despite Stephanie Garcia coming off the bench to score 16 points on four 3-point shots. The Sharks missed layups and easy shots early and fell behind 13 points and never could make up the difference. Meanwhile on the wrestling mat, the Sharks Wrestling team got off to a good start. During Winter Break, the squad captured the district duals championship for the second consecutive year, the first team in the county to win twice in a row. The Sharks posted a team record 15-0 in this year’s dual competition. Plus, the Sharks placed second in the Graves Invitational in mid-December. According to the coaches, honorable mention goes out to: Josh Guerra, who is currently ranked first in the state and a record of 14-1 with 8 pins; Lane Keck is undefeated at 22-0; Chris Felix undefeated at 18-0; Oscar Hernandez with a 23-1 record including a team-leading 17 pins; and Nico Hernandez a freshman with a 21-3 record.